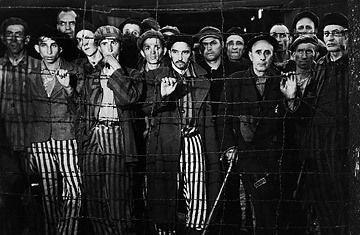 Unlike Ahmadinejad, most revisionists do not deny that Jews were interned in prison camps during World War II; rather, they argue that the number of deaths was greatly exaggerated. Gas chambers are a particular sticking point: Holocaust deniers say they were purely a rumor or, if they indeed existed, were not powerful enough to kill  though evidence and history indicate otherwise. And the photographs of emaciated and dying Jews? Attorney Edgar J. Steele, a revisionist, says, "All those pictures of skinny people and bodies stacked like cordwood were actually of Czechs and Poles and Germans [who] died of typhus, which was rampant in the camps."